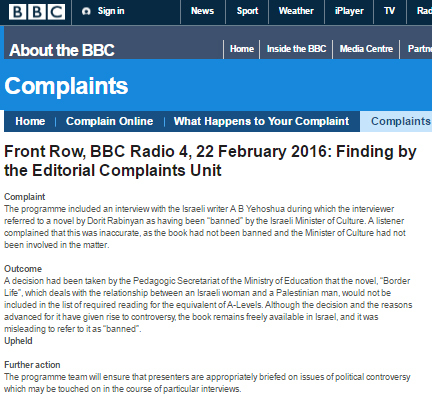 CAMERA’s BBC Watch has prompted correction of a BBC Radio program which falsely claimed that Israel banned Borderlife, a book by Dorit Rabinyan. The following is cross posted from BBC Watch. Back in July the BBC’s Editorial Complaints Unit upheld a complaint submitted by BBC Watch which had previously been twice rejected by the corporation’s complaints department. The complaint concerned the inaccurate claim that the book Borderlife by Dorit Rabinyan had been “banned” by an Israeli minister. During our correspondence with the ECU, we raised the question of how the listeners who were misled by the inaccurate broadcast would be made aware of that fact and suggested that an on-air correction in the same programme would be the most efficient way of ensuring that a correction reached the original audience. As we previously noted here in connection to the absence of a dedicated corrections page on the BBC News website, the whole point of making corrections is to ensure that audiences receive the corrected information. We can now report that the program concerned has been edited and the recording available online no longer includes the inaccurate claim (previously from 27:03) that the book ‘Borderlife’ was ‘banned’ by the Israeli Minister for Culture. At the beginning of the recording an insert advises listeners of the edit and the webpage now includes a footnote with the URL of the ECU decision. The action taken by the “Front Row” team is of course welcome and appropriate: new listeners to the recording will now not be misled by inaccurate information. However, it remains highly unlikely that audience members who heard the original broadcast nearly seven months ago would at this juncture return to that webpage and see that a correction has been made.